I know this post (and previous ones) have absolutely nothing to do with our farm and, well, lives in general. But I have become completely fascinated with what we humans can do when it comes to building things….and taking them down. This photo is day 1 – the beginning of the end. 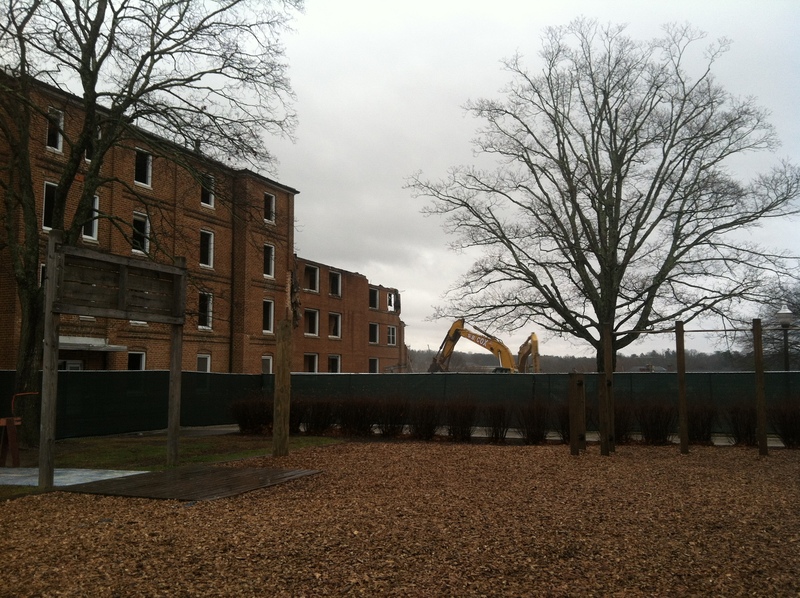 This photo is from this morning and shows the machines now are where a part of the building once stood (i.e. the hull of the building above just beyond the no trespassing sign in the above photo). They have made the turn and are about halfway through. This building was quite old. I see them shoot plumes of water around the active deconstruction areas. I am sure it is to keep the debris and particles from going airborne. What is fascinating is that these machines have jaws at the end (like a crab claw) and just pinch away at the brick, concrete and steel. They organize the debris into neat and orderly piles according to material type. The construction group working on this project is the same one that redid Shultz dining hall into the new Center for the Arts. We were told that 90% of the materials from that deconstruction project were recycled. I have no doubt that the neat piles of debris are slotted for the same fate. Pretty cool. I do know that a lot of the brick is to be repurposed for the new VT walkway that will be placed in front of Lane Hall after the dorm reconstruction is complete. And that is what I find amazing. That we can build something based on someone’s idea on paper and then take it down later in life…only to rebuild yet again.